Rammed full of top tips, tools and techniques that will enable teachers to create a more positive, praise-based culture in their schools and classrooms. The default setting in British education seems to be gloom. Schools are under relentless pressure and the data-driven league table culture means that we often forget about the humans we work with. So what can teachers do to make pupils school lives more joyous? Toward, Malton and Henley believe that the answer lies in harnessing the tools of praise and positivity so that the school setting becomes an environment in which all can thrive from pupils to cleaners, and from head teacher to teaching assistants. 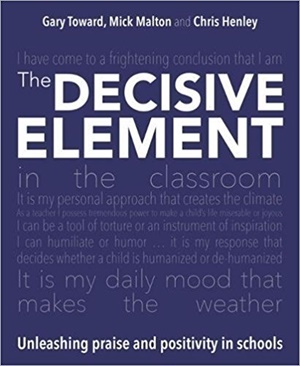 Drawing on the authors combined 100 years of experience, 'The Decisive Element' provides powerful, researchinformed strategies to help teachers create a culture in which pupils become the best they can be. Suitable for all teachers, in both primary and secondary settings, and anyone who works in education or with children.